Sometimes you don't need a full sized kit to focus on the little stories of the day! This fun playset is designed to give you all you need to tell the story at a mini-price! Inside you'll find the BRIGHTER DAYS paper pack with 14 patterned papers and 8 bonus solids for a total of 22 papers! You'll also unpack a collection of just enough pretties including: a happy puddle jumper, birds, butterflies ladybugs and a little buzzing bee, rainboots, plants, garden tools, a watering can, a birdhouse, a picket fence, a happy sun, puffy clouds, a colorful rainbow, a banner of umbrellas, a puddle to jump in, rubber icon dots, raindrops, 3 feltboard sentiments, 5 flowers, 2 frames, a strip of grass, a curl of string and a piece of ribbon, colred labels, 2 leaves, 12 rubber words strips, 3 strips of washi and 3 pieces of veneer Word Art. *not all items are shown in preview. This item coordinate with the other MARCH 2019 BYOC products! Drop shadows for illustration only. This digital kit has been saved as .png files at 300 dpi. Not all items shown. Personal Use Only please. CHILL OUT page kit | by ForeverJoy Design"
7 pieces of meaningful word art designed to prompt your pages and 10 rubber styled word snips. A snow capped pine tree and decorated Christmas tree, a leaf, a pine branch, 4 layered flowers, and 4 puffy sticker flowers. 6 pieces of word art and 11 rubber styled worn snips. *not all items are shown in preview. This item coordinates perfectly with the other December 2018 BYOC products! Drop shadows for illustration only. This digital kit has been saved as .png files at 300 dpi. Not all items shown. Personal Use Only please. This kit is packed with thoughtfully designed papers and pretties that'll not only make your notebook pages beautiful- but are also so easy to use! Simply PRINT and PLAY! What’s inside this collection? Everything you need to craft your JOY! and a collection of pretties in PNG and PDF you can decorate your notebook with! Paper inserts and journal cards are sized at TN friendly size of 4x8’ All are in JPG format as well as PDF sheets- no Photoshop required! PNG print and cut sheet that can be easily cut out in your file cutting software (like Silhouette) or with good old-fashioned scissors! PDF format that you can simply cut out- no Photoshop needed! Templates are packaged in PSD format for use in your photo editing program with text boxes ready for you to type right into! CHESTNUT LANE page kit | by ForeverJoy Design"
2 sweet foxes, a little robin, boots made for taking long walks in, a lantern always leave on, a basket of apples, a few pumpkins, pretty acorns, a little butterfly and a little basket to gather whatever your heart desires. 5 silk flowers, 3 leaves a pinecone, an orange slice, 2 wreathes and bunches of cotton flowers. 8 word strips, 4 veneer styled words, 3 letter board sentiments and 2 circled word sentiments. *not all items are shown in preview. This item coordinates perfectly with the other NOVEMBER 2018 BYOC products! Drop shadows for illustration only. This digital kit has been saved as .png files at 300 dpi. Not all items shown. Personal Use Only please. "Better days are coming, they are called Saturay and Sunday." Inside you'll find the WEEKEND VIBES paper pack (with 15 patterned papers and yes! 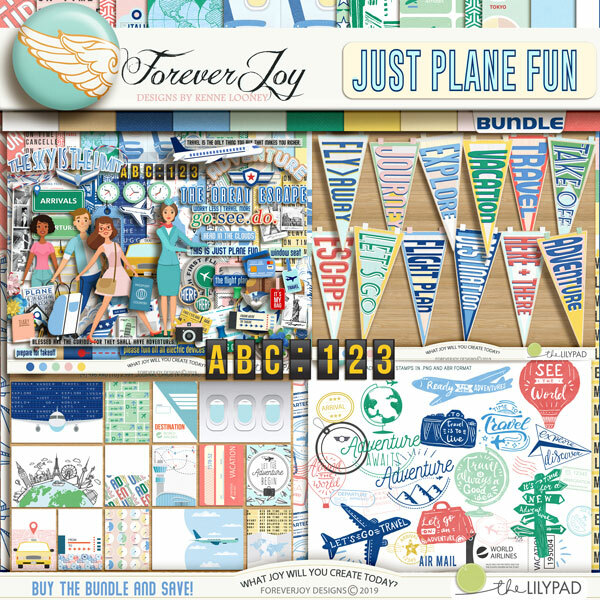 9 bonus solids) plus a collection of pretties and Word Art that help you craft the JOY of weekends at home! A collection of cozy home pretties including a fireplace to get warm by, a big comfy chair colored various ways, a cuddly knit blanket, scented candles, a few books and the weekend paper, balls of yarn, a pup and kitten, and a gal happy in her weekend vibe (darker skin, and various hair colors included). various pieces of meaningful word art designed to prompt your pages including, banner styled, felt styled and paper snips. Inside this playset you'll find 15 patterned papers, 5 solids and a variety of themed pretties including - 4 not-so-scary kittys, 5 fang-tastic pups 3 party balloons, 2 bows, a creepy bat, a binder clip, 4 rubber spots, 4 feltboard sayings, 4 layered flowers, 3 sketched frames, 3 journal labels, 2 pet leads, 3 colored leaves, a strip of paper lace, 2 pumpkin bells, 2 puffy sticker jack-o-laterns, 2 strips of ribbon, (lucky!) 13 word snips, 3 spool toppers, chipboard stars, a stiched circle, 2 tassles, a curl of bakers twine, 4 pieces of Word Art and 3 strips of washi tape. 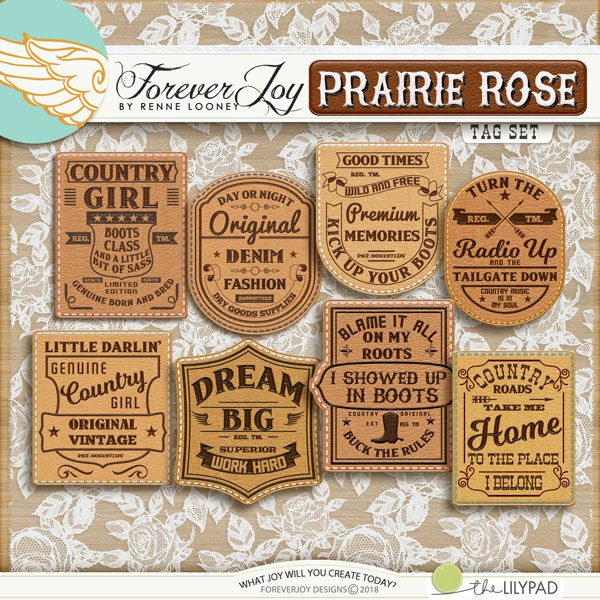 "Sometimes all you need to set things right is a weekend and a dirt road"
Inside you'll find the Prairie Rose paper pack (with 25 patterned papers and yes! 7 bonus solids) plus a collection of pretties and Word Art that help you craft the JOY of being a country girl- no matter where you may live! lots of elements too add a little country sass to your stories including 2 boot-scootin’ boots, 4 heel kickin’ country girls, a pickup truck (colored red and blue) a wagon wheel, a cowboy hat, a guitar to sing a country song with, a picket fence, 3 cactus plants, and a collection of critters: a horse, pig, cow and chicken! 14 pieces of meaningful word art designed to prompt your pages including, felt letterboards, banner styled word art and veneer styles plus an additional 12 worn snips. 2 teacups that may or may not have a little whiskey in them! "and suddenly you know it's time to start something new and trust the magic of new beginnings"
lots of Autumn JOY including: an apple, acorns, hand drawn mushrooms alone for you to pick and gathered in a little banner, colorful falling leaves, a pencil, and a happy little squirrel! 2 happy kids on bikes- each colored 4 various ways for a total of 8! 19 pieces of meaningful word art designed to prompt your pages including, felt letterboards, sticker and alternate stamped styled word art, veneer and cork styles plus an additional 15 rubber and paper styled snips. *not all items are shown in preview. This item coordinates perfectly with the other SEPTEMBER 2018 BYOC products! Drop shadows for illustration only. This digital kit has been saved as .png files at 300 dpi. Not all items shown. Personal Use Only please. "because the best place to go this summer is Home"
lots of old fashioned summer fun including a grill to fire up, a picnic table, mason jar drinks, strings of lights to brighten those outdoor summer nights, a picket fence, a retro bike, a little red wagon, a banner of flags and a bunting too! Yummy summer goodies like watermelon, a bag of chips, a bottle of pop, ice cream, a hot dog and hamburger. Festive pretties like colored balloons, paper fans, a pinwheel, a scattering of beads, a gingham bow, an American flag, bursts of fireworks, and sparklers. A happy chipboard sun, suntan lotion and flipflops. 6 happy kiddos, and lady liberty herself! 12 pieces of meaningful word art designed to prompt your pages including, fabric labels and veneer styles plus an additional 11 rubber styled worn snips. *not all items are shown in preview. This item coordinates perfectly with the other July 2018 BYOC products! Drop shadows for illustration only. This digital kit has been saved as .png files at 300 dpi. Not all items shown. Personal Use Only please.